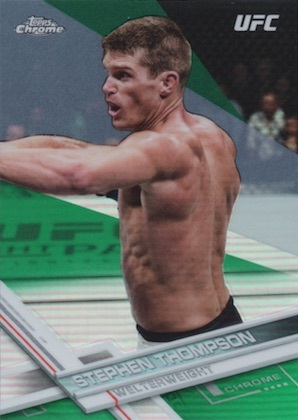 A debut release that is only found in a hobby format, 2017 Topps UFC Chrome brings the popular finish and Refractor parallels to fans of the Ultimate Fighting Championship. Each box includes at least two autographs with a third autograph found in case-hit hot boxes. Showcasing the flagship baseball design, the base set looks across the history of UFC with past, present and future stars. Just like the other chromium sets, the rainbow is quite large with base Refractor (1:3 packs), X-Fractor (1:24 packs), Diamond Refractor (case-hit hot box only; 1 per pack), Green Refractor (#/99), Blue Wave (#/75), Gold Refractor (#/50), Orange Refractor (#/25), Black Refractor (#/10), Red Refractor (#/5), SuperFractor (1/1), and Printing Plates (1/1) parallels. 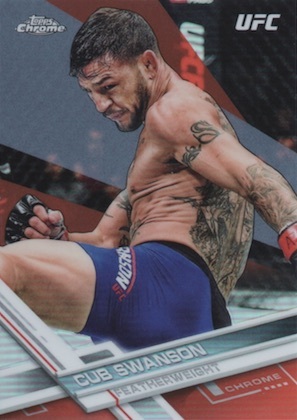 Tapping into the other Topps UFC brands, the 2017 Topps UFC Chrome inserts each average 1:6 packs. This includes UFC Fire, UFC Museum, UFC Tier 1 and Top of the Class. Each insert also offers Refractor (#/99), Pulsar Refractor (#/50), and SuperFractor (1/1) parallels while Fire adds Gold Refractor (#/75) editions. 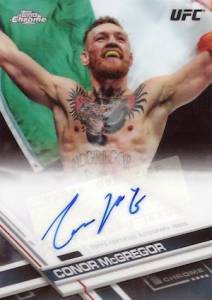 Yielding two signed cards per box, 2017 Topps UFC Chrome also features up to 35 fighter Autographs on the base design with some being on-card. Hot Box Refractor autographs fall one per case, making for a third hit in those boxes. Other signed parallels include Green Refractor (#/99 or less), Gold Refractor (#/50 or less), Orange Refractor (#/25 or less), Black Refractor (#/10 or less), Red Refractor (#/5 or less), and SuperFractor (1/1). 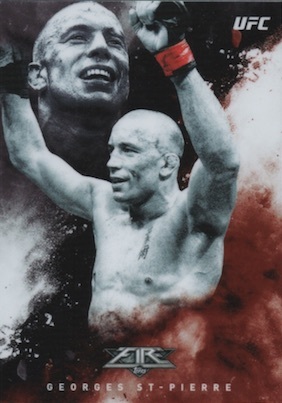 Autograph Variations, limited to ten copies or less, switch the image for UFC superstars. 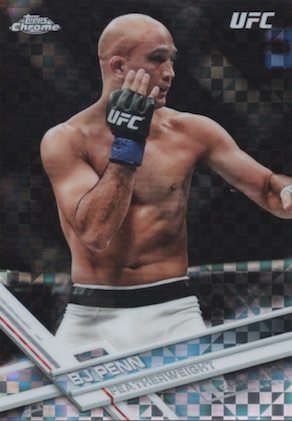 In addition, collectors can find low-numbered Autograph (#/5) versions of the UFC Fire, UFC Museum, UFC Tier 1 and Top of the Class inserts for select subjects. 100 cards. 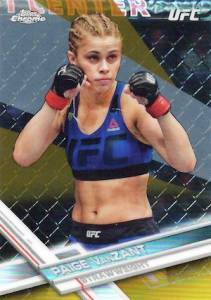 Shop 2017 Topps UFC Chrome base sets on eBay. PARALLEL CARDS: Refractor (1:3 packs), X-Fractor (1:24 packs), Diamond Refractor (Hot Box), Green Refractor #/99, Blue Wave Refractor #/75, Gold Refractor #/50, Orange Refractor #/25, Black Refractor #/10, Red Refractor #/5, SuperFractor 1/1, Printing Plates 1/1. PARALLEL CARDS: Hot Box Refractor (1 per case), Green Refractor #/99, Gold Refractor #/50, Orange Refractor #/25, Black Refractor #/10, Red Refractor #/5, SuperFractor 1/1. 25 cards. 1:6 packs. Shop on eBay. PARALLEL CARDS: Refractor #/99, Pulsar Refractor #/50, SuperFractor 1/1. 11 cards. Serial Numbered #/5. 19 cards. Serial Numbered #/5. 18 cards. Serial Numbered #/5. Good: Many on-card autographs; great insert variety; nice Refractor rainbow opportunity; hot boxes. Bad: Several key names have sticker autographs; no original designs. The Bottom Line: The Chrome debut for UFC is a welcome sight for the fans, as chromium can really enhance a design. 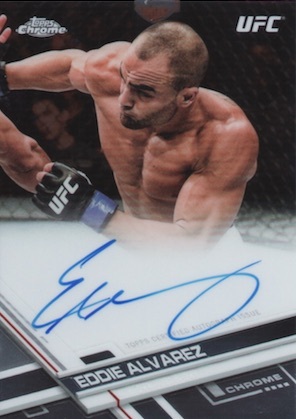 Looking at the entire product, the set is a solid option for UFC collectors and a great addition to the Topps UFC portfoilio. 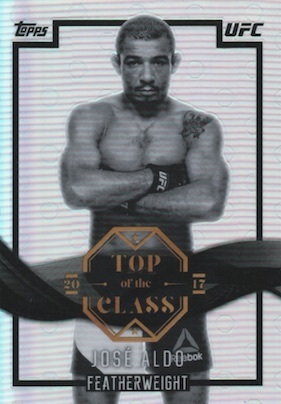 From a design perspective, nothing in 2017 Topps UFC Chrome is actually original. However, the Chrome aspect is new, and it still offers a freshness. The release is actually deceivingly simple, with just a base set, one main autograph and four inserts. Using the flagship baseball design, the fragmented parallel colors really stand out. I also like the X-Fractors. In my opinion, the parallels walk on the right side of the line for having enough without being excessive. 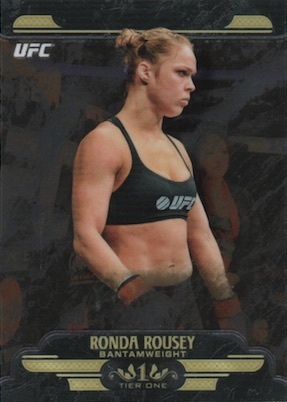 Likely familiar to collectors, the inserts all come from other UFC sets. On the one hand, the selection is nice and the cards look great. I particularly enjoy the Chrome Fire inserts. Still, it would be better to have something new here even if it’s just one insert. While the master set is manageable, it will take several boxes to complete the full base and inserts. This is not the worst thing to buy multiple boxes of, plus you increase your chances for a hot box. It does feel like a lot of these UFC sets push the same signers over and over, but top names like McGregor and Rousey continue to sell well, so they are a welcome addition. In addition to the more established names, the 37-fighter checklist does feature some younger options. However, these supply many of the low-value names, as well. 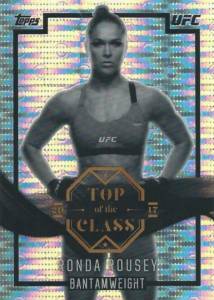 Chromium does help value, so out of the gate, 2017 Topps UFC Chrome scores good marks. Hot boxes also provide a boost, as do the hard-signed options. 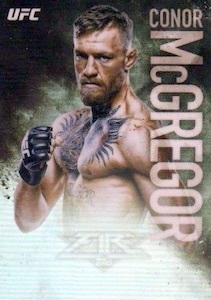 It is disappointing that McGregor and Rousey both have sticker autographs since they are the best-selling names. Box prices have come down since release, hovering around $70-90 at the time of this review, so that is more appealing. Given that only a handful of signers command strong values, you either need to seek out the low-end of the hobby box price range or hope for a hot box. Refractors and on-card autographs are always a good recipe for fun to me, and that is what this box delivered. Of course, more valuable fighter autographs would have been nice, but that can be said about most boxes. When analyzing the fundamentals of the product, the assortment of Refractors combined with the insert selection increases the fun even if I’d prefer something unique to the set. I look forward to 2018, hopefully with a little originality in play. 2017 Topps UFC Chrome GEORGES ST-PIERRE Auto Gold Refractor 18 25 Champ!!!! 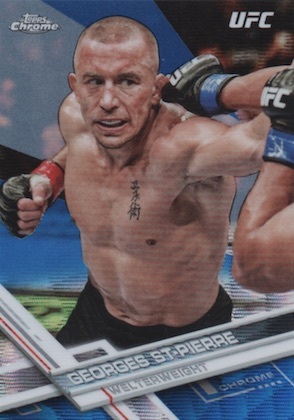 2017 Topps UFC Chrome GEORGES ST-PIERRE Auto Refractor 15 20 Champ!!!! 2017 Topps UFC Chrome GEORGES ST-PIERRE Auto Refractor 11 20 Champ!!!! Great debut for UFC in Chrome. I pulled a Conor McGegor Black Refractor Auto #1/10!! So yes I’m lovin it. The inserts are set at the right amount per box too. Finally UFC gets a shiny product. 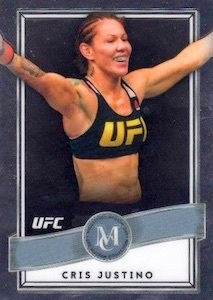 I was a huge fan of UFC Finest and have been screaming to get Finest or Chrome UFC cards. 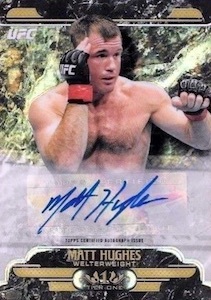 The formula for the Topps UFC Chrome product is much better than the Football products as you get 2 autos per box. Cannot confirm if there were hot boxes as my 1/2 case has the advertised number of hits per box. Another nice touch that they did was produce a chrome version of the smaller sets i.e Top of the Class, Fire and tier one. The parallels in the boxes have been very balanced in terms of distro of color variants. I did not hit a superfractor but have pulled blacks and orange in at least every other box. The price point has been pretty spot on with the “estimated value” of the cards. The only thing I will say that there is alot of RC autos in here so those are large wildcards with value. Take for example the Amanda unes cards from 2013 and 2014; they were $1 clearance cards for years up until 2017..
Take this as you may but this is the best produt in my opinion that topps has produced in the past 3 years..